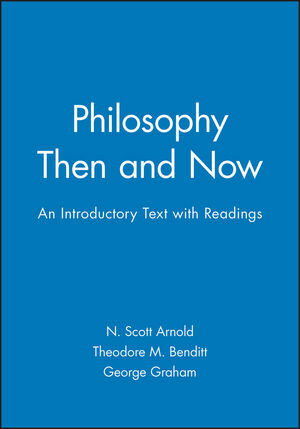 Philosophy Then and Now provides an innovative and engaging blend of introductory text with classic and contemporary readings. Each of the eight parts begins with an introductory section on the major ideas associated with a seminal figure from the history of philosophy. This is followed by key selections from the essential writings of that philosopher, as well as influential selections from contemporary figures. Key figures covered include: Socrates, Aquinas, Locke, Descartes, Mill, Nietzsche, Marx, and Sartre. By focusing on the core themes, issues and problems of philosophy, the volume motivates student interest in the subject, and represents a distinctive text for all introductory courses in philosophy. N. Scott Arnold is Professor of Philosophy at the University of Alabama at Birmingham. He has been a visiting scholar at the Hoover Institution at Stanford University and at the Social Philosophy and Policy Center at Bowling Green State University in Ohio. He is the author of Marx's Radical Critique of Capitalist Society (1990) and The Philosophy and Economics of Market Socialism (1994). Theodore M. Benditt has been Dean of the School of Arts and Humanities at the University of Alabama at Birmingham since 1984 and a member of its Philosophy Department since 1978. He is the author of Law as Rule and Principle: Problems of Legal Philosophy (1978) and Rights (1982). George Graham is Professor of Philosophy and Psychology and Chair of the Department of Philosophy at the University of Alabama at Birmingham. He is the former editor of the journal "Behavior and Philosophy" and the author of Philosophy of Mind (Blackwell, 1993). He co-edited (with Hugh LaFollette) Person to Person (1989); and (with G. Lynn Stephens) Philosophical Psychopathology (1994); as well as (with William Bechtel) A Companion to Cognitive Science (Blackwell, 1998). 1. Mind, Body, and Death. Introductory text: "Socrates and the Soul of Death": George Graham. Selected Readings: Plato, Phaedo (selections). Descartes, Principles of Philosophy, Correspondence, Passions of the Soul. Thomas Nagel, "Death". Gareth Matthews, "Life and Death as the Arrival and Departure of Psyche". Jerry Fodor, "The Mind-Body Problem". Introductory Text: "Sartre on Being Free": George Graham and Harold Kincaid. Selected Readings: Jean-Paul Sartre, Being and Nothingness (selections). Pierre Simone de Laplace, Philosophical Essays on Determinism (selections). Daniel Dennett, "On Giving Libertarians What They Say They Want". Robert Kane, "Free Will: The Elusive Ideal". Introductory Text: "Aquinas and the Rationality of Belief in God": Gregory Pence. Selected Readings: Thomas Aquinas, "Five Ways to Prove the Existence of God", from Summa Theologica. William Paley, "The Evidence of Design". John L. Mackie, "Arguments for Design". William L. Rowe, "The Cosmological Argument." R. M. Adams, "Kierkegaard's Arguments Against Objective Reasoning...". Fydor Dostoevsky, "Why Does God Permit Evil?" from The Brothers Karamazov. Introductory Text: "Descartes and Our Knowledge of the External World": G. Lynn Stephens. Selected Readings: Descartes, Meditations on First Philosophy (selections). Bertrand Russell, The Problems of Philosophy (selections). W. V. O. Quine, "Posits and Reality". Bruce Aune, Knowledge, Mind and Nature (selections). Introductory Text: "Mill and the Nature of Science": Harold Kincaid. Selected Readings: John Stuart Mill, A System of Logic (selections). Carl Hempel, Philosophy of Natural Science (selections). Karl Popper, "Philosophy of Science: A Personal Report". Thomas Kuhn, The Structure of Scientific Revolutions (selections). J. J. C. Smart, "Physics and Reality". 6. The Nature of Morality. Introductory Text: "Nietzsche and the Objectivity of Morals": James Rachels. Selected Readings: Friedrich Nietzsche, Beyond Good and Evil (selections); Genology of Morals (selections). David Hume, "Morality, Sentiment, and Reason" (selections from the Treatise ). A. J. Ayer, "A Defence of Emotivism". Renford Bambrough, "A Proof of the Objectivity of Morals". Ronald Dworkin, "The Concept of a Moral Position". Introductory Text: "Locke: The Individual, the Public, the State" (selections). Selected Readings: Plato, The Republic (selections). Thomas Hobbes, Leviathan (selections). John Locke, 2nd Treatise (selections). John Stuart Mill, On Liberty (selections). George Dargo, "Private Property and Legal Takings" (selections). Charles A. Reich, "The New Property" (selections). Michael Sandel, "Morality and the Liberal Ideal". Iris Marion Young, "Impartiality and the Civic Public" (selections). Introductory Text: "Marx and the Problem of Justice": N. Scott Arnold. Selected Readings: Karl Marx, Preface to Contribution to the Critique of Political Economy (selections). Karl Marx, The Communist Manifesto (selections). Karl Marx, Critique of the Gotha Program (selections). John Rawls, A Theory of Justice (selections). Robert Nozick, Anarchy, State, and Utopia (selections). * An innovative blend of introductory text with classic readings. * Thematically-arranged, introducing eight of the central problems of philosophy for beginners. * Each section of classic readings is accompanied by an introductory essay. * The volume includes over 40 classic and contemporary readings. * Each introductory section is written by a leading authority.